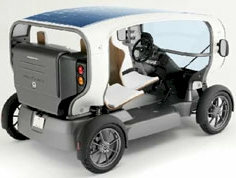 Urban 3-seater electro-solar or wind vehicle is the first production energy-autonomous vehicle in history. Eclectic takes advantage of moments of immobilisation to store energy in its NiMH batteries. It offers a range up to 50 km at a speed of 50 km/hr and can also be recharged from the grid in 5 hours. Pre-production batch with increase in output and drop in price expected in 2007. 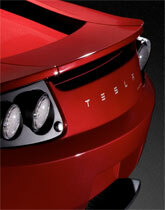 ## – 2006, TESLA CARS, proove to the world that the best of cars is an ELECTRIC CAR, using batteries to store energy. And like soon we will have the ULTRACAPACITOR technology ready to store even much more energy per kilo, with a full recharche possible within minutes, we can expect to see very competitive Electric cars on the market before the end of a decade. And they are annonced to be more performant, cheaper to build and maintain, silent with no exhaust at all, and will then replace the old ICE engine based cars. The car of our kids will be electric, and that’s a good news ! Electricity will be produced in respect of our planet, by solar, wind and other means. The Tesla Roadster, a two-seat electric vehicle being commercialized by Tesla Motors has become the poster child for electric cars. The company claims the vehicle will go from zero to 60 miles per hour in about 4 seconds and travel 250 miles per charge, at an operating cost of about 1 cent per mile. The combination of a lithium-ion battery pack, a 248-horsepower electric motor, an aluminum chassis, and a beautiful design has gained the company plenty of media attention and led people to reserve the first 100 cars. Their initial run of 100 cars sold out in less than three weeks. Demand was so strong, Tesla Motors found itself bumping people, on the waiting list, who ordered a car but couldn’t pony up the $100,000 deposit fast enough, said Mike Harrigan, Tesla’s vice president of marketing. The Tesla has a carbon-fiber body, but it is heavier than similarly performing sport cars – 1,000lbs of its total weight of 2,500lbs comes from its battery, made up of 6,831 liquid-cooled, lithium ion cells of the kind used to power laptops. Tesla promises that the battery can be recharged in around three hours, gives a range of 250 miles and has a life of at least 100,000 miles, after which it can be recycled. Plug it in at night when you pull into the garage, and you can drive about 250 miles on that charge the next day. Just like the fuel gauge in your existing car, the instruments inside the Tesla Roadster indicate how many more miles can be driven before you need to think about recharging. So unlike the old days of electric vehicles, now you can drive electric without the anxiety youll run out of charge and be left stranded. Telsa collaborated with an outside firm known for expertise in lithium ion battery safety to perform hundreds of tests to validate the safety of the design. In these tests, they set out to simulate a worst-case scenario in which a cell develops a serious malfunction. In each test, they set a cell on fire in the middle of a battery pack (by heating the heck out of it) and observed the results. The design contained these failures to a single cell, demonstrating that malfunctions wouldnt spread. Tesla hopes to sell 500 to 600 cars next year and perhaps 2,000 to 2,500 a year starting in 2008. Tesla is also developing a four-door, all-electric sedan which, according to Martin Eberhard, Tesla’s CEO, will be “big, fast and efficient – don’t think Corolla, think BMW.” The company is planning on selling the sedan, to be built in the United States, with a price of less than $50,000, by 2008. The first EEStor, Inc. automated production line has been proven to meet the requirements for precise chemical delivery, purity control, parameter control and stability. In addition, EEStor, Inc. has completed the initial milestone of certifying purification, concentration, and stability of all of its key production chemicals — most notably the attainment of 99.9994% purity of its barium nitrate powder. EEStor technology is expected to surpass all existing battery technologies, with its microsecond recharging and capacity for millions of 100% charge/discharge cycles. The environmentally-friendly technology is affordable and designed for versatile “racked and stacked” configurations. “We have built a state-of-the-art facility and have exceptional personnel onboard”, said Weir. EEStor, Inc. remains on track to begin shipping production 15-kilowatt-hour Electrical Energy Storage Units (EESU) to ZENN Motor Company in 2007 for use in their electric vehicles. The production EESU for ZENN Motor Company are expected to function to specification in operating environments as severe as negative 20 to plus 65 degrees Celsius, will weigh less than 100 pounds, and will have ability to be recharged in a matter of minutes. A much-shrouded idea could give portable power a real charge, for a change  and change, well, everything ! Imagine the day when cellphones charge up in seconds, laptop batteries never degrade, and electric cars have the same power, driving range and purchase price as their gas-powered cousins. It’s a consumer’s dream and an engineer’s fantasy: Safe, affordable and eco-friendly batteries that can store immense amounts of energy, allow for lightning-fast charging, and handle virtually unlimited discharging with little affect on quality. Such a battery  a superbattery  doesn’t exist today, but a tiny company out of Austin, Texas, is getting remarkably close, and the possibilities have caught the attention of the U.S. army, the former vice-chairman of Dell Computer, and one of the most respected venture capital firms in North America. Not much is known about awkwardly named EEStor Inc., and the company prefers to keep it that way. It has no website. Hits on Google are remarkably low. And as far as requests from the media are concerned, the company makes its position crystal clear: Go away. …Energy storage has long been the bottleneck for innovation, holding back new energy-sucking features in mobile devices and preventing everything from the electric car to renewable power systems from reaching their full potential. Build a radically better battery at lower cost, experts say, and the world we know will be forever transformed. … Among EEStor’s claims is that its “electrical energy storage unit” could pack nearly 10 times the energy punch of a lead-acid battery of similar weight and, under mass production, would cost half as much. It also says its technology more than doubles the energy density of lithium-ion batteries in most portable computer and mobile gadgets today, but could be produced at one-eighth the cost. If that’s not impressive enough, EEStor says its energy storage technology is “not explosive, corrosive, or hazardous” like lead-acid and most lithium-ion systems, and will outlast the life of any commercial product it powers. It can also absorb energy quickly, meaning a small electric car containing a 17-kilowatt-hour system could be fully charged in four to six minutes versus hours for other battery technologies, the company claims. According to patent documents obtained by the Star, EEStor’s invention will do no less than “replace the electrochemical battery” where it’s already used in hybrid and electric vehicles, power tools, electronic gadgets and renewable energy systems, from solar-powered homes to grid-connected wind farms. …EEStor’s technology, to be accurate, isn’t really a battery at all. In techie speak it’s a ceramic ultracapacitor with a barium titanate dielectric. A mouthful to be sure, but what’s important is that it’s designed to combine the superior storage abilities of a battery with the higher power and discharge characteristics of an ultracapacitor. Batteries, from the throwaway Energizer Bunny variety to the nickel-metal hydride units in a Toyota Prius, are great for storing large amounts of energy through chemical reactions, but they’re notoriously slow when it comes to absorbing and releasing that energy. They’re also sensitive to temperatures, made up of toxic materials, and anyone who owns a digital camera, laptop, or handheld vacuum knows that after draining and recharging a few hundred times the battery degrades to the point of being useless. On the other hand you’ve got ultracapacitors, based on an invention that dates back to 1745. These little devices hold energy as an electric charge and release it instantly as a power-packed jolt of electricity  not unlike the static shock you might get after walking on a rug and touching a metal doorknob. Ultracapacitors, unlike batteries, can also absorb a charge as fast as they release it. And they’re also “green,” in the sense that they contain no nasty chemicals and aren’t made of toxic substances. Reliable in the coldest winters and warmest summers, “ultracaps” can typically be cycled  that is, completely discharged and recharged  more than a million times, outlasting any iPod or that electric scooter in your garage. … Last month, researchers at the Massachusetts Institute of Technology announced they had achieved a breakthrough that could potentially overcome these energy-storage limitations. Using carbon nanotube structures, they claimed to have developed a way to improve by 100-fold the energy storage capacity of ultracapacitors. …The details of their research are sketchy, but it involves a method of processing, mass-producing and using barium titanate powder as an insulator  the dielectric  helping EEStor’s energy storage system achieve a radical increase in voltage and energy storage without compromising reliability. Another key to this process is the ability to lower the cost of production enough to become price-competitive with conventional battery technology, itself a major feat. … That possibility, that earth-shattering potential, has turned just as many skeptics into believers  a number of them highly credible. Last fall, it was reported that venture capital powerhouse Kleiner Perkins Caufield & Byers led a $3 million (U.S.) investment in EEStor. Kleiner Perkins has a track record for picking winners. It made early bets on Google, Sun Microsystems, Amazon.com, Netscape and a host of other high-tech success stories that went on to become leaders of the computing, Web and telecommunications sectors. … According to patent documents, EEStor describes the day when gas stations evolve into “electrical energy stations” that store energy overnight when electricity is cheap and sell it like gasoline during daytime. Drivers could pull in and recharge their EEStor-powered car in a few minutes the same way we now fill up with gasoline. 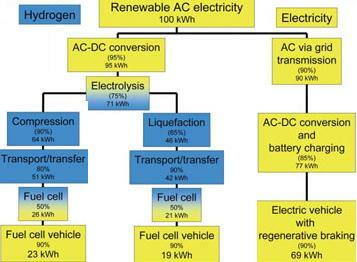 … Now, with the advent of the digital age, battery technology has been one of the crucial limiting factors. Joel E. Schindall, the Bernard Gordon Professor of Electrical Engineering and Computer Science (EECS) and associate director of the Laboratory for Electromagnetic and Electronic Systems; John G. Kassakian, EECS professor and director of LEES; and Ph.D. candidate Riccardo Signorelli are using nanotube structures to improve on an energy storage device called an ultracapacitor. Capacitors store energy as an electrical field, making them more efficient than standard batteries, which get their energy from chemical reactions. Ultracapacitors are capacitor-based storage cells that provide quick, massive bursts of instant energy. They are sometimes used in fuel-cell vehicles to provide an extra burst for accelerating into traffic and climbing hills. However, ultracapacitors need to be much larger than batteries to hold the same charge. The LEES invention would increase the storage capacity of existing commercial ultracapacitors by storing electrical fields at the atomic level. … However, despite their inherent advantages – a 10-year-plus lifetime, indifference to temperature change, high immunity to shock and vibration and high charging and discharging efficiency – physical constraints on electrode surface area and spacing have limited ultracapacitors to an energy storage capacity around 25 times less than a similarly sized lithium-ion battery. The LEES ultracapacitor has the capacity to overcome this energy limitation by using vertically aligned, single-wall carbon nanotubes – one thirty-thousandth the diameter of a human hair and 100,000 times as long as they are wide. How does it work? Storage capacity in an ultracapacitor is proportional to the surface area of the electrodes. Today’s ultracapacitors use electrodes made of activated carbon, which is extremely porous and therefore has a very large surface area. However, the pores in the carbon are irregular in size and shape, which reduces efficiency. The vertically aligned nanotubes in the LEES ultracapacitor have a regular shape, and a size that is only several atomic diameters in width. The result is a significantly more effective surface area, which equates to significantly increased storage capacity. The new nanotube-enhanced ultracapacitors could be made in any of the sizes currently available and be produced using conventional technology. This work was presented at the 15th International Seminar on Double Layer Capacitors and Hybrid Energy Storage Devices in Deerfield Beach, Fla., in December 2005. The work has been funded in part by the MIT/Industry Consortium on Advanced Automotive Electrical/Electronic Components and Systems and in part by a grant from the Ford-MIT Alliance. A tiny South Korean company is out to make capacitors powerful enough to propel the next generation of hybrid-electric cars. Let’s say it’s 2010, and you’re boiling off midlife ennui or burnishing your golden years in time-honored fashion: by zooming around in a high-performance road machine. The car accelerates powerfully, and yet it moves quietly and nimbly, slaloming through curves like a go-cart. Best of all, it sips gas like a connoisseur enjoying 40-year-old …. Would you believe you owe these rejuvenating, guilt-free thrills to a bunch of capacitors? Not just any capacitors, of course. To understand what’s going on under the hood of this car, you’ll need to leave behind the Lilliputian world of the picofarad and the microfarad and enter the realm of the kilofarad. It is a place where NessCap Co., in Yongin, South Korea, holds sway. NessCap is one of about 10 makers of ultracapacitors, devices that can store so much charge that they are beginning to blur the functional distinction between the capacitor and the battery. And according to some experts, nobody does it better than NessCap, which offers a unit rated atB an impressive 5000 farads at 2.7 volts in a package a little bigger than a half-liter soda bottle. NessCap’s capacitors “perform as well as or better than any others we’ve ever tested, in terms of energy and power density,” says Marshall Miller, a research engineer at the University of California at Davis, where he specializes in testing advanced capacitors and other devices. Ultracapacitors made by NessCap and others are just now starting to show up in products ranging from toys to experimental buses, basically as alternatives to batteries. The worldwide market isn’t large; it was just US $38 million in 2002, the most recent year for which figures are available, according to the research firm Frost & Sullivan, in San Antonio. But NessCap and the handful of other makers of the largest ultracapacitors all have their sights set on the automotive market, which could do for their business what the iPod did for sales of MP3 songs. Frost & Sullivan, at least, is a believer; the company optimistically predicts total 2007 revenues for ultracapacitors of $355 million. On paper, anyway, the idea is not far-fetched. In comparison with batteries, ultracapacitors can put out much more power for a given weight, can be charged in seconds rather than hours, and can function at more extreme temperatures. They’re also more efficient, and they last much longerin tests at the Idaho National Engineering and Environmental Laboratory, in Idaho Falls, upwards of 500 000 charge-discharge cycles have been recorded. Automotive traction batteries, for comparison, have much shorter lifetimes, particularly if they are discharged deeply. Pondering the relative strengths of capacitors and batteries, Joel Schindall, associate director of the Laboratory for Electromagnetic and Electronic Systems at the Massachusetts Institute of Technology, in Cambridge, says: “In all ways other than energy density, an electric field is superior to chemistry for storing energy regeneratively, because it is completely reversible” and therefore intrinsically efficient and durable. Part of Schindall’s research focuses on advanced materials that could be used as electrodes in future ultracapacitors. Ultracapacitors are now establishing themselves in niches demanding a power source that can recharge quickly, be sealed into a system that has to last for years, or put out prodigious amounts of power in short bursts. Tokyo-based Ricoh Co. is using them in copier machines to store the energy needed to warm up the machines quickly, minimizing time spent in the energy-wasting standby mode. Makers of high-end car stereo amplifiers are using ultracapacitors to deliver the surges of power demanded by musical crescendos, without straining the vehicle’s battery. Another use is in solar tiles; a new twist in landscape architecture, they’re used to guide pedestrians at night, by storing solar-generated electricity during the day and using it to power a small light-emitting diode panel after dark [see photo, “Bright Idea”]. Sealed into a walkway, wall, or staircase, these clear, rugged tiles have to last for a decade or more, working without fail night after night, withstanding subfreezing and sweltering temperatures alikecriteria only ultracapacitors can fulfill. And then there are cars. The hybrid-electric vehicle, in its various forms, is poised for an increasing share of the automotive market in several parts of the world, including the United States. And ultracapacitors have already found their way into hybrids, albeit in a minor role: hardly noticed among the Toyota Prius’s many celebrated technical breakthroughs is the fact that it uses ultracapacitors, from Panasonic, to power an electric-hydraulic pump in the mechanical braking system. It’s just the start of what some experts say ultra-capacitors will do for hybrids. For example, with their lightning-fast charge and discharge capability, ultracapacitors could handle the power surges needed for accelerating, allowing engineers to use a smaller battery pack in the vehicle (and eventually, perhaps, no battery pack at all). Shielded from high-current pulses, the batteries would last longer, too. This article continue in 4 other pages… I can’t put all here. ZPE means Zero Point Energy; This energy gets its name from the fact that it is evidenced by oscillations at zero degrees Kelvin, where supposedly all activity in an atom ceases. Abstracts of the story of Tesla’s car:Taken into a small garage, Dr. Tesla walked directly to a Pierce Arrow, opened the hood and began making a few adjustments. In place of the engine, there was an AC motor. This measured a little more than 3 feet long, and a little more than 2 feet in diameter. From it trailed two very thick cables which connected with the dashboard. In addition, there was an ordinary 12 volt storage battery. The motor was rated at 80 horsepower. Maximum rotor speed was stated to be 30 turns per second. A 6 foot antenna rod was fitted into the rear section of the car. The device had been prefitted into the dashboard, no larger than a short-wave receiver. Mr. Savo told Mr. Ahler that Dr. Tesla built the receiver in his hotel room, a device 2 feet in length, nearly 1 foot wide, a 1/2 foot high. These curiously constructed tubes having been properly installed in their sockets, Dr. Tesla pushed in 2 contact rods and informed Peter that power was now available to drive. Mr. Savo drove a distance of 50 miles through the city and out to the surrounding countryside. The car was tested to speeds of 90 mph, with the speedometer rated to 120.
. Of the motive source he referred to “a mysterious radiation which comes out of the aether”. The small device very obviously and effectively appropriated this energy. Tesla also spoke very glowingly of this providence, saying of the energy itself that “it is available in unlimited quantities”. Dr. Tesla stated that although “he did not know where it came from, mankind should be very grateful for its presence”. The two remained in Buffalo for 8 days, rigorously testing the car in the city and countryside. Dr. Tesla also told Mr. Savo that the device would soon be used to drive boats, planes, trains, and other automobiles. Once, just before leaving the city limits, they stopped at a streetlight and a bystander joyfully commented concerning their lack of exhaust fumes. Mr. Savo spoke up whimsically, saying that they had “no engine”. They left Buffalo and traveled to a predetermined location which Dr. Tesla knew, an old farmhouse barn some 20 miles from Buffalo. Dr. Tesla and Mr. Savo left the car in this barn, took the 12 tubes and the ignition key, and departed. Arawa, Papua New Guinea (AHN) – Even as efforts are on to find alternative fuels to petrol and diesel across the world, residents on a tiny island in Papua New Guinea run their cars and generators on refined coconut oil. What is more, many of them have set up mini-refineries to produce the low-cost environmentally friendly new fuel, helping boost the country’s economy. It may not be far before the technology spreads to other parts of the world as inquiries started pouring in to Bougainville island, according to reports. The new invention happened as an answer to the fuel woes being faced by the islanders in face of growing oil prices hitting their businesses. Now the sweet-smelling fuel make the residents less dependent on the imported diesel. Copyright © AHN Media Corp – All rights reserved. Redistribution, republication. syndication, rewriting or broadcast is expressly prohibited without the prior written consent of AHN. Invented by Langmuir in 1926 , this device produces a temperature of 3700 degrees centigrade. Tungsten can be melted, diamond vapourised. A jet of hydrogen gas is dissociated as it passes through an electric arc. H2 > H + H – 422 kJ. An endothermic reaction, with the intensely hot plasma core of the arc providing the dissociation energy. The atomic hydrogen produced soon recombines; and this recombination is the source of such high temperatures (easily outperforming oxy-hydrogen: 2800oC and oxy-acetylene: 3315oC). The hydrogen can be thought of as simply a transport mechanism to extract energy from the arc plasma and transfer it to a work surface. It produces a true flame, as the heat is liberated by a chemical reaction. H + H > H2 + 422kJ. The molecular hydrogen burns off in the atmosphere, contributing little to the heat output. 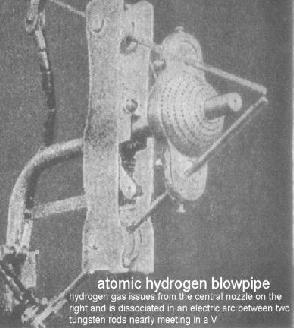 “Atomic hydrogen. – Langmuir (1912) has shown that hydrogen in contact with a tungsten wire heated by an electric current at low pressure, is dissociated into atoms:H2 2H. This splitting of the hydrogen molecule is attended by the absorption of a large amount of energy, about 100kcal per gram molecule. The atomic hydrogen so formed is chemically very active. Langmuir also showed that atomic hydrogen is formed when an electric arc between tungsten electrodes is allowed to burn in hydrogen at atmospheric pressure. The atomic hydrogen was blown out of the arc by a jet of molecular hydrogen directed across the arc, and formed an intensely hot flame, which is capable of melting tungsten (m.p. 3400oC). This flame obtains its heat not from combustion but from the recombination of hydrogen atoms into H2. It is suitable for melting and welding many metals. Iron can be melted without contamination with carbon, oxygen or nitrogen. Used extensively before the second world war, particularly in germany. The method was known as Arc-Atom. The welding torch consists of two inclined tungsten electrodes across which an AC arc is struck. Annular nozzles around the electrodes carry hydrogen gas. The gas streams converge forming a fan shaped flame. A transformer with an open circuit voltage of 300V is required to strike and maintain the arc in hydrogen. Because of the high thermal conductivity of hydrogen, the plasma channel in the arc is constricted, offering very high energy concentration. Arc-Atom welding was of particular use for such jobs as surfacing dies, where the high flame temperature enabled a thin surface layer to be deposited on the thick base metal. Modern sheilding gas methods such as MIG and TIG processes have replaced Arc-Atom, but do not have the extreme temperatures and arc constriction qualities of atomic hydrogen.